Pinsent Masons has been a legal advisor on most of Northern Ireland’s largest infrastructure projects for over a decade. 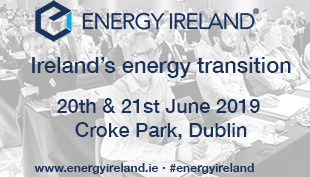 agendaNi speaks with Projects Partner Adrian Eakin who is heading up their infrastructure practice in Ireland on the need for an investment pipeline, and where we can learn lessons from other regions. 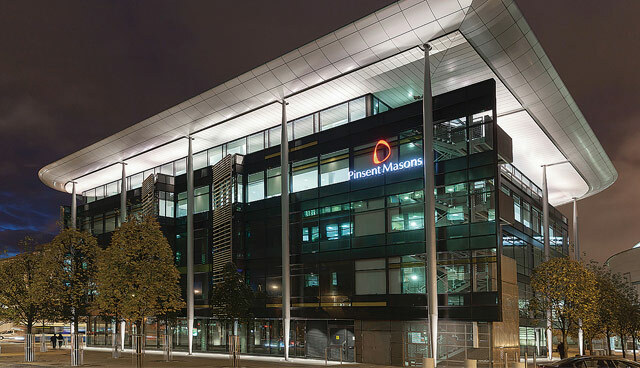 Can you give us a brief introduction to Pinsent Masons? Pinsent Masons is a global 100 law firm (posting FY16/17 revenues £423.1 million), specialising in the energy, infrastructure, financial services, real estate and advanced manufacturing and technology sectors. The firm employs nearly 3,000 people worldwide, including around 1,500 lawyers and 400 partners. The firm’s international footprint encompasses seven offices across Asia Pacific, two offices in the Middle East, five offices in continental Europe and one in Africa. The firm also has comprehensive coverage across each of the UK’s three legal jurisdictions, including 85 people in Belfast and over 20 in Dublin where we have recently opened and have ambitious growth plans. Infrastructure is one of Pinsent Masons’ global sectors – what benefit does that bring to clients here? Pinsent Masons’ sector strategy is built upon bringing market-leading knowledge and expertise to clients, and within infrastructure that includes major UK schemes such as City Deals, HS2 and the expansion of Heathrow, and schemes closer to home such as Irish Schools, Dublin’s transport projects and the Irish Primary Care developments. Our reputation is recognised by a multitude of awards including the ‘Energy and Infrastructure Team of the Year’ at the recent Legal Business Awards 2018, and Who’s Who Global Construction Law Firm of the Year 2018 for the 11th year running. Working on projects of critical importance at a national level means we can bring that experience and insight on issues that can affect local clients. In Northern Ireland, for example, we are working with a number of government bodies on how best to achieve savings in PFI contracts. That appointment was built on our Belfast team’s experience of advising on the English pathfinder schemes, and local clients wanted to have the benefits of lessons learned in other markets. What is your footprint in the Northern Ireland infrastructure market? We have been involved in almost every major local infrastructure scheme including all of the projects procured by the Strategic Investment Board. That includes the Education Authority on the £500 million Belfast Schools Strategic Partnering Project, the Western Health and Social Care Trust on the procurement of South West Hospital, Queen’s University Belfast on its Student Accommodation scheme, the development of new headquarters for Allstate NI and Concentrix, and Somague on the Ulster University and A6 projects. You recently opened in Dublin, why? Our vision is to be recognised as an international market leader in the global sectors in which we specialise. Dublin has long been in our thinking given its reputation as a key global hub for the financial services and technology industries – a status that has only become even more significant in the context of Brexit. The feedback from our clients as we have developed our Ireland strategy is that they would welcome a disruptor coming further into the market and our reputation as an innovator is of significant interest to them. That said, we’ve been active in Ireland for over 25 years, advising Government on the early transport projects and clients such as Balfour Beatty and Aberdeen Standard Life (and their lenders) on some of the more recent infrastructure schemes procured by the NDFA. A lot of the bidders and lenders in the Republic of Ireland market are large international players who we work with in other jurisdictions. We bring our global strength and experience to bear in delivering these projects. What issues does the local infrastructure market face? Quite a few. There is a serious infrastructure deficit in Northern Ireland but without a local Assembly and ministers in place not much is going to happen. The market would like to see a refreshed strategic plan backed by proper political will, an open mind on how best to finance large schemes and flexible contracts which reflect lessons learned over the last 20 years. If Northern Ireland is to compete within a globalised economy we have to continue to improve and invest quickly, and not having government in place isn’t an option. Can Northern Ireland learn lessons from other regions? Definitely, and very close to home too. The past two decades have seen significant changes in infrastructure development and financing, and the Republic of Ireland is regarded as a country that takes infrastructure planning seriously. Critics of private finance in infrastructure are unlikely to have bought their home with a lump sum, so they should be open minded about spreading the cost of major projects over 20 or 30 years, provided it offers value for money. The focus should be on regulating profits, making contracts flexible, not transferring unnecessary and expensive risks and operating contracts rigorously once they are signed. England, Scotland, Wales and the Republic of Ireland have factored all of these issues into their standard contracts and planned accordingly. They realise that a critical part in attracting inward investment is the quality of a country’s infrastructure. How do you see our infrastructure changing over the next 10 years? Infrastructure is an area that is hugely dependent on the political environment, and we are facing a significant period of uncertainty. Brexit, and a diverging political spectrum within the UK means infrastructure planners and financiers have a lot to consider. The commitment to a policy of re-nationalisation under a Jeremy Corbyn UK premiership would certainly represent a massive change of direction. Another topical issue in infrastructure is the impact of how technology and data are driving and disrupting infrastructure projects. 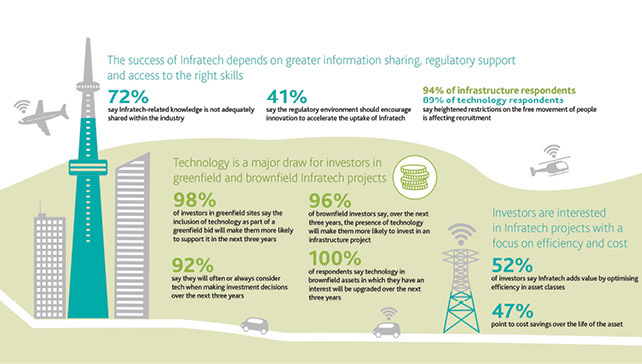 That interaction was the subject of our recent report ‘The evolution of Infratech’.